I have clearly been on a slow cooker recipe kick lately! I just love those evenings when dinner is done (and even cleaned up minus the plates – or bowls in this case!). 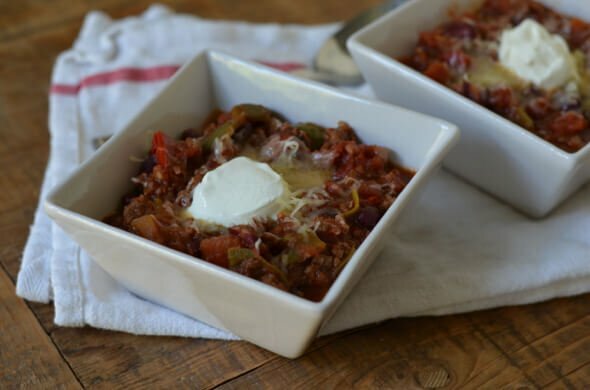 Whether you are busy entertaining guests from out of town or just have a hectic afternoon or evening planned, your slow cooker is the only thing between you and a wholesome real food meal like this chili with green bell peppers. 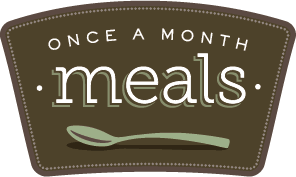 Speaking of easy make-ahead meals, our sponsor, Once A Month Meals, is an expert in that department! They have mastered the art of making a month’s worth of meals (breakfast, lunch AND dinner) in just one day. It may sound too good to be true, but the reality is, if you follow their detailed guides, it can be done. As one of their members, you will have access to recipe cards (serving size customizable), freezer directions, organized grocery lists, step-by-step cooking day instructions, and printable labels. Be sure to check out their “Whole Foods” and “Paleo” meal planning tracks. In a medium sauté pan over medium-low heat, melt the butter. Add the onions and cook until they begin to soften, about 6 or 7 minutes. Add the bell peppers, jalapeño, and garlic to pan and cook while stirring occasionally for 4 to 5 more minutes. Turn the heat up to medium, add the ground beef to the pan, and break it up with a spatula while cooking. Season the meat with the chili powder, cumin, and salt. After 4 or 5 minutes, once the meat has browned, add the mixture to the bottom of the slow cooker. Top it with the tomatoes, beans, and bay leaf. Turn slow cooker to high and cook for 4 or 5 hours. Serve warm with recommended toppings. How much liquid would you recommend adding to the recipe if using dry kidney beans? Mieke – This is totally a guess, but I would try adding 1/2 cup dried beans and 3/4 to 1 cup of water to the recipe (in place of the canned beans). I know this probably goes without saying, but I would also make sure you soak the beans overnight the night before, then drain and rinse well … Or quick soak by a quick boil on the stove. Even better, precook them. I have not had good luck with using dried beans in chili, they never seem to get cooked enough because of the acidity in the tomatoes. You cannot cook red kidney beans in the slow cooker. They contain a toxin that is not neutralised in the slow cooker as the temperatures do not get high enough during the cooking process. You can cook any other bean though, although definitely soak them overnight if you wish to go this route. If you want to add red kidney beans, cook them first separately. Tania – I have never heard of such a thing (and therefore doubt the validity)…care to share your source? See post below with link. She’s correct. Here is the information straight from the FDA about this topic. I guess you learn something new every day! Thanks for sharing, but based on the link it looks like the possibility of something like this happening is extremely rare! Good to know though. Question on slow cooker cooking: I am out of the house at 750a and not back until 515p, will setting it on low work or is that too long a time? my slow cooker turns to “warm” so it no longer cooks after the time that I have set. Do you have that setting? Kari – I have not tried it on low for that long, but I do think it would work. Let us know! My experience has been with chili that the longer it is in the crockpot, the more flavorful … but since everything is precooked, it does tend to dry out (I have scorched it, even on low). I would add some broth (maybe ~1 cup) if you’ll be leaving it in there all day long. I leave the house at 5am and return at 7pm and still use my crockpot weekly. Mine doesn’t have a timer so for $10 I bought an electronics timer. It was very simple to set up. Now I just prep my food the night before and leave it in the fridge until morning when I transfer it to the pot. I think the food stays cold enough to be safe until the timer kicks on around noon. I have even started some with frozen chicken. I may have to reconsider this in the summer when my house is 90 degrees though. I made chilli versy similar to this a couple days ago. However I use much more chilli powder. I purchase it from a German Baptist store where they don’t use MSG or GMOs. I wonder how the flavoring will turn out without so much chilli powder. I didn’t use cumin either. But i did use chilli, garlic, and onion powders. Hi Lisa, I love your recipes, however, we are a vegetarian family. I was wondering if you could include a vegetarian option with your recipes that would still use whole foods and would still taste good? I got cut off the last should be more beans and quinoa. Grated cauliflower! It works amazingly well. We are big meat eaters in our house but I was on a special diet for a while where I couldn’t eat meat and we made this vegetarian chili. http://www.foodnetwork.com/recipes/food-network-kitchens/spicy-vegetarian-chili-recipe/index.html I didn’t miss the meat at all! I too LOVE the slower cooker and can not wait to try this chili! Made this for dinner tonight! It was so easy and my family loved it. Thanks for sharing! Hi! Is it 28 ounces of tomatoes total or 56 total? Thanks! Yes, 2 – 28 ounce cans of tomatoes! This sounds great. I read about adding broth/water to the chili, but my family prefers using V8 juice,usually the spicy kind. I put that in everything that requires a broth or water. It just adds more flavor and is (for my girly) soy free. Thank you for posting great recipes. This was the first recipe I made from your site, and I’m very happy to report that it was delicious! My 2 year old pounded it down, the 4 year old ate many spoonfuls that didn’t have detectable green chunks (says she doesn’t like peppers), and my husband and I really enjoyed it. I’ll definitely make it again! Should the meet be drained after browning? When i was getting ingredients for this together, I made my own stewed tomatoes as canned tomatoes are one of the worst foods you can buy canned. The acid content of tomatoes make them more prone to absorbing the toxins in the can than any other canned food. I found it takes 12 Roma tomatoes to make 2 jars of stewed tomatoes for this recipe. Also, I was a little confused by the “chili powder”. If you go to the spice section, “chili powder” has silicon dioxide in it to keep it from sticking together along with several other spices and a lot of salt. I ended up buying powdered “chili fruits” or “chili para naranja” which is all natural without the additives and without added salt, garlic, etc. I also cooked my own small red beans. It’s a great recipe!!! My wife just saw this recipe and it looks like we will be having this for supper soon! We did see the recipe calls for grass fed beef…we recently ordered a Quarter Beef (grass fed) and were wondering if you have any meal plans around general meat cuts that come with a quarter beef? 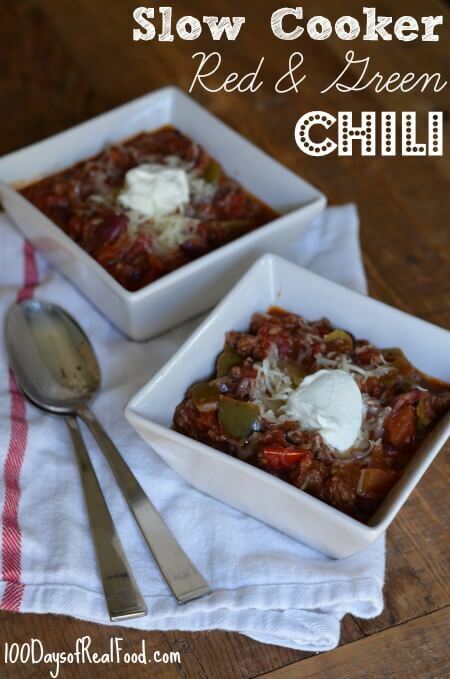 I used this recipe for our Co-op Chili Cook-off last weekend and won 1st place!! yay!! can’t wait to buy it!! This is in my crockpot as we speak and it smells delish!!! Thanks so much for all your helpful and absolutely yummy recipies! Couldn’t have made the switch without them! I make this recipe regularly with a few differences: no jalapeÃ±os (because I don’t like them) or bay leaf, 1 1/2 tablespoons chili powder, and 1/2 teaspoon black pepper. I’ve gotten creative a few times and added corn or other beans like black beans and cut the meat in half. My mother got the recipe from the LA Times food section about 25 years ago and our family has loved it ever since. Goes great with corn bread or biscuits and is excellent as leftovers. You can make it on the stovetop and simmer for about two hours instead of using the crock pot, but the flavor isn’t nearly as good. I cook it on high for four hours or low for 6-8 hours depending on how much time I have. Always turns out great. Cooked this chili all day (7.5 hrs) on low while at work. What a great gift to come home to – delicious dinner all ready to go on a rainy night! Very family friendly meal. Question, with all the salt in the canned tomatoes and beans, is the tsp of salt called for in the recipe all that necessary? We loved the chili and had seconds and now are realizing we had over 1000mg of sodium 0.0 I understand your position on nutrition facts, just wondering why the added salt when there was so much in the cans? The meal is really fantastic. It is healthy and tasty. I am not sure about how i will make it but, I am sure to give it a try. I made this earlier in the week and it’s delicious. The only complaint that I got was that it was a bit too soupy. I think next time I might drain one of the cans of tomatoes. We wound up scooping the solids out with a slotted spoon and then just putting a little of the broth over top. The flavor was fantastic, though! Made this yesterday and turned out DELISH! I did not use a bay leaf, added a little more chili powder, and used chili diced tomatoes. Oh and I also added black beans. I will definitely be using this recipe again in the future! This was the best chili I have ever had. Clean fresh food and full of flavor. I froze some of it for later and the rest I put together a salad of mixed lettuce organic shredded white cheddar cheese and organic salsa for lunch at work. I made this earlier this week. It was a big hit. The only problem I had with this recipe is I could not fit two cans of tomatoes in my crock pot. So, I only used one can. I really don’t think it needed two cans because it would have been too watery. Ok. I feel really silly asking this because I am a pretty decent home cook and have made chili on several occasions… but here goes: If all of the ingredients are cooked when placed into the crockpot, how are they not painfully overcooked after 5 hours on high?? When I make soup, I leave the cooked meat until the last phase so it doesn’t get over cooked. I really do need to know, after 5 hours in the crock pot, won’t ground turkey (I can’t eat beef) just disintegrate? 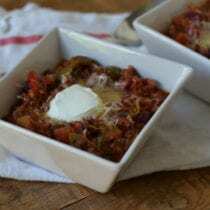 Made this with range-fed ground beef from the farmer’s market – Loved it! This needs to be a twice a month meal! To make a vegetarian version would you substitute a opulent more cans of beans for the meat? This sounds very silly but I am a novice cook at this point. After adding to the slow cooker, how often do you stir it all together? Thanks so much! I made this today & OMG it turned out amazing! I added some taco seasoning (trader joes) no additives. So perfect! Thank you for recommending this! I feel like a chili pro now! I made this Sunday and sent it to school with my kindergartner yesterday! She came home with a empty lunch box which rarely happens! And was asking for it for dinner last night. Until I started making your whole-wheat pizza pockets which were a huge hit all the way around. Thanks for the delicious and easy recipes! Very good. It did seem a little liquid-y, so I think I will add more beans and possibly more meat next time. Great flavor, though. What brand of chili powder do you use? I just looked at the ingredients on the kind I have here at home and it says chili pepper, salt, spices, silicon dioxide(added to make free flowing), and garlic. I’m sure I’m not using the best out there! Thanks in advance!! Love your site SO much!! I made this and it was SO SO good! Amazing recipe!!! I made many recipes from your site and they are all amazing. Thumbs up!! This sounds a lot like how I’ve always made my chili except I’ve never thought to use my crock pot! Smart idea! I love a little fresh cilantro chopped on top as a garnish. Yum! How about using fresh tomatoes? How many and would it turn out the same? Does this chili freeze well? Would I just put it in the jars like all the soups? Do you drain the meat after cooking it? If not is it greasy/fatty? I make this chili several times a year, and typically use 90% lean ground beef and don’t need to drain the fat. I have also used 80% leam ground beef and that was a bit too oily / fatty for my taste. Could you make this with beef or lamb stew meat, sear and then slow cook a little longer? I mean I know you *can* just curious if it would hold up, require some ingredient modifications, etc. Would you address your stand on tomatoes in cans vs in glass? I can never find tomatoes in glass jars but I always read how harmful they are in cans. Gave this recipe a five star rating because I never make chilli so I used this recipe for a chilli cook off that I was invited to with some church friends. Who knew, you had the best chilli in town. My chilli won and the crock pot was dry as a bone when I went to get the leftovers. Thanks for the easy recipe. Can this be made without the meat? Hi there. We’ve not tried making this recipe without meat.